Last night I picked up my beloved from the late bus and we went to a local restaurant for a glass of wine and a bar snack. While sitting at the bar I was faced to a window that looks out to the restaurant's deck where they have tables for diners. An attractive woman was sitting there with her partner or husband who I couldn't see. She was in her fifties. Now I was looking in that direction due to my placement at the bar but not looking at her even though I noticed her as she was very attractive. You know what I mean? Anyway, she must have thought that I was in fact looking at her as she soon began looking back - with 'that look'. I felt that I was definitely getting the 'come-on'. Should I have alerted my beloved or, as I did, enjoyed the ego-stroking?" - Wondering. In the words of Captain Mainwaring to Corporal Jones "I think you are wandering into the realms of fantasy there". What on earth are you thinking? I suggest that you should have gone to the men's room and looked at yourself in the mirror to check yourself out. The woman probably thought she saw drool coming out of your mouth or that you were spilling the wine down your shirt. She was probably tossing up whether to call the management to have you evicted or to call for some medical support for you. As for ego -stroking I definitely think that something was being stroked. Should you have alerted your beloved? No, not unless you wouldn't be embarrassed by her laughing. Sorry Aunty you are wrong. The clue appears five times. She read Peter's pupil dilation. A subtle clue that we all pick up on subconsciously ; but women are probably better at it. "Another thing that causes pupil dilation is physical or psychological pleasure. 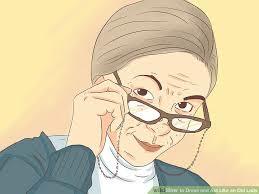 When someone finds another person or thing attractive, the pupils dilate. In turn, that dilation is often found attractive by others. This is sometimes referred to as 'bedroom eyes' because of its sexual connotation" Whikipaedia.